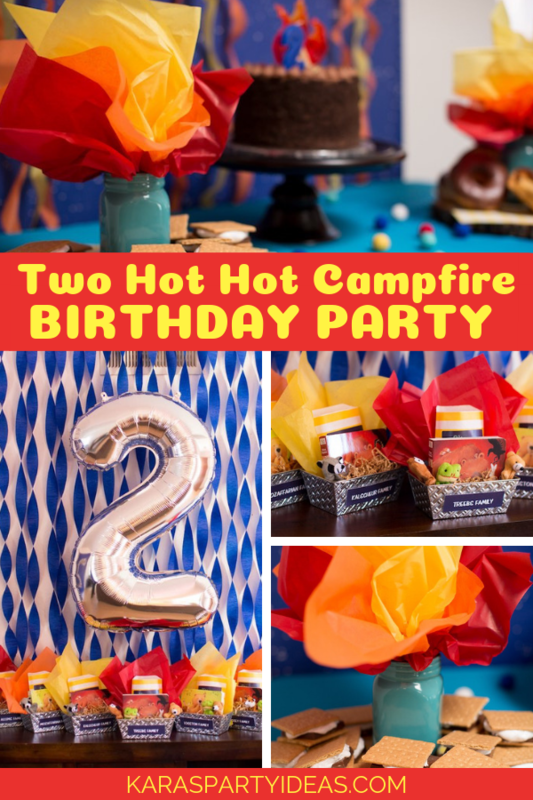 Sizzling details by the ton…this Two Hot Hot Campfire Birthday Party is packed with party ideas, oh so fun! 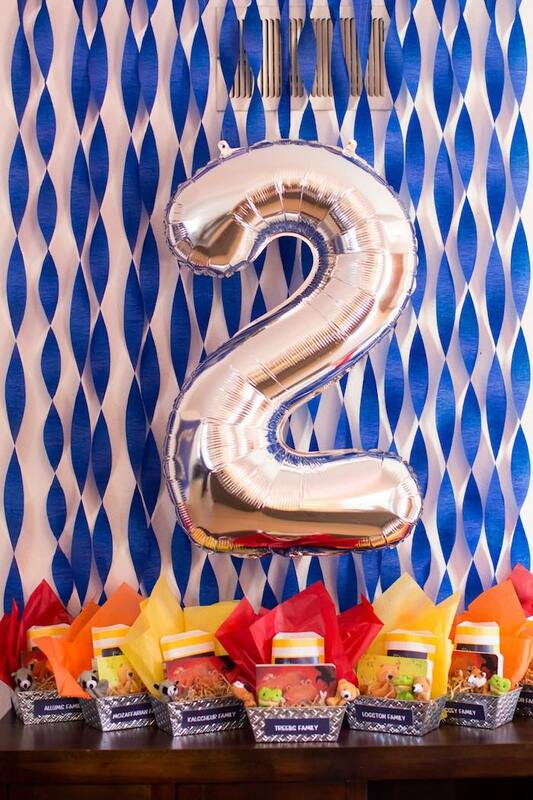 Styled by Maureen Walker of a la Mo, out of San Diego, CA; this second birthday bash is sure to be a celebration to remember! its one of my favorite ages. I love to find out what interests them and whats going on in their little minds. When my son still wasnt saying a whole lot, he was very clearly saying, hot, hot!. He was obsessed with all things hot- grills, cooking, fireplaces, campfires, etc. 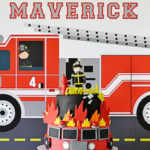 My husband and I would joke that we hoped hed either become a firefighter or a chef (and hopefully not anything more sinister). 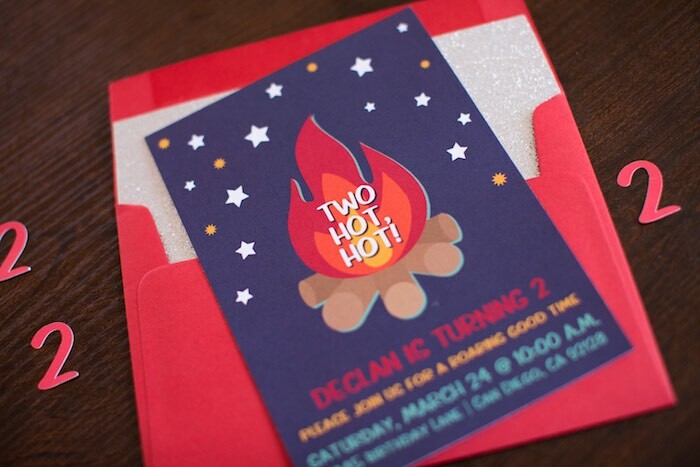 Naturally, my mind wanted to turn his interest in hot things into a party theme. 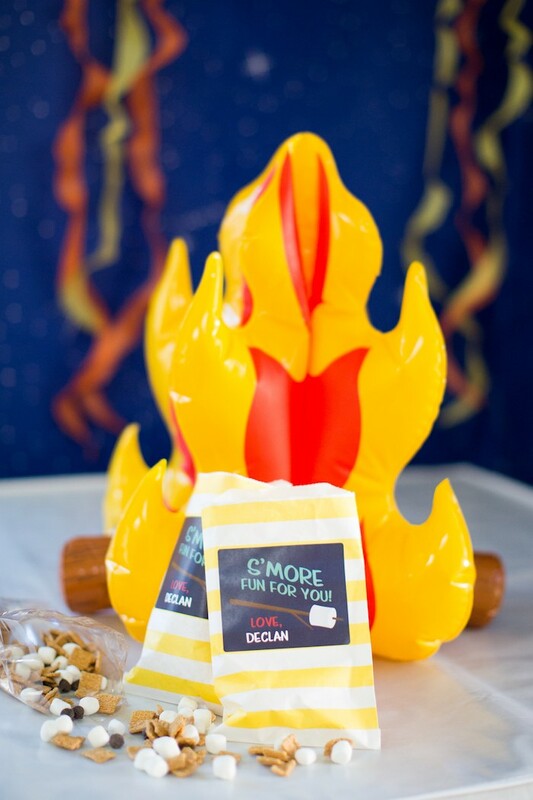 So, we threw a camp fire party for our little guy. 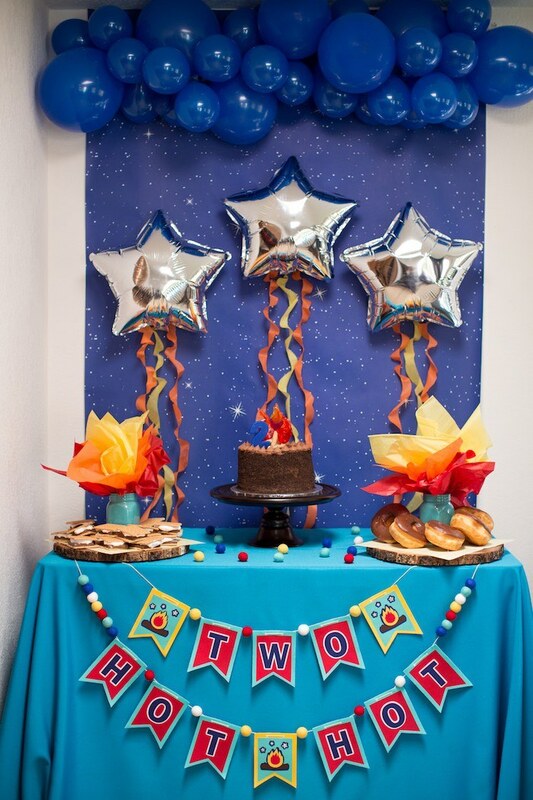 We started this party in the morning to plan around nap times for the little kids. Also, I just love brunch. 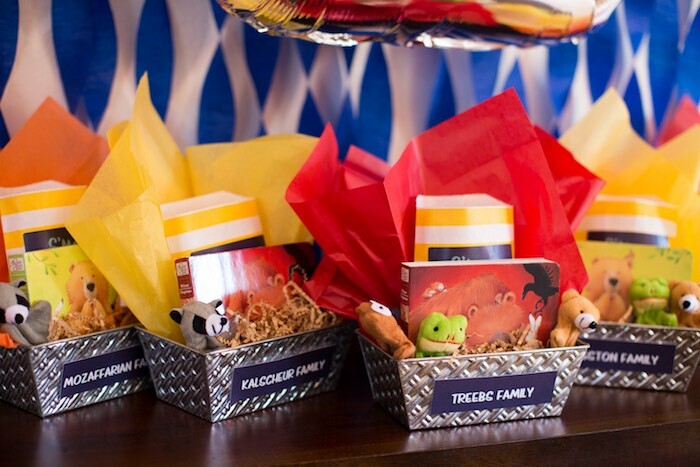 For food we tried to keep things kid-friendly and also make parents happy. 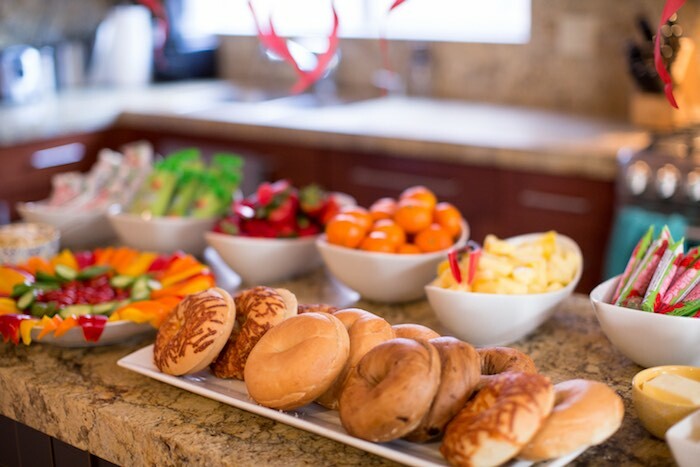 Bagels, quiche, fruit, yogurt, and hummus did the trick. To drink we had juice for the kids and prosecco and cold brew coffee for the grownups. 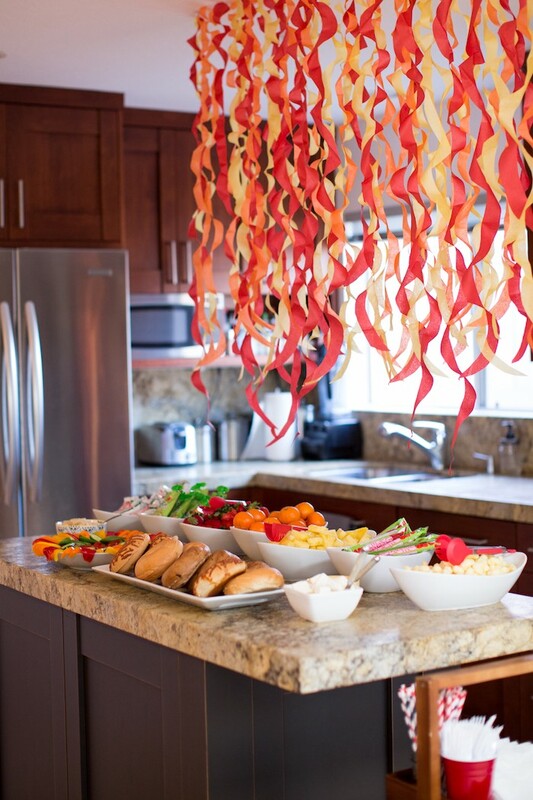 All the food was setup on the kitchen island under an explosion of tissue paper flames. I kept the sweets fairly simple this time. 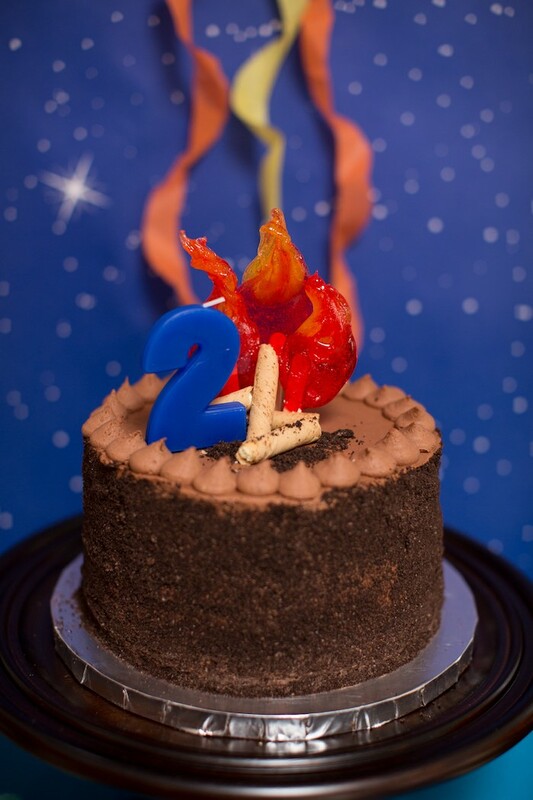 The cake was homemade and chocolate. 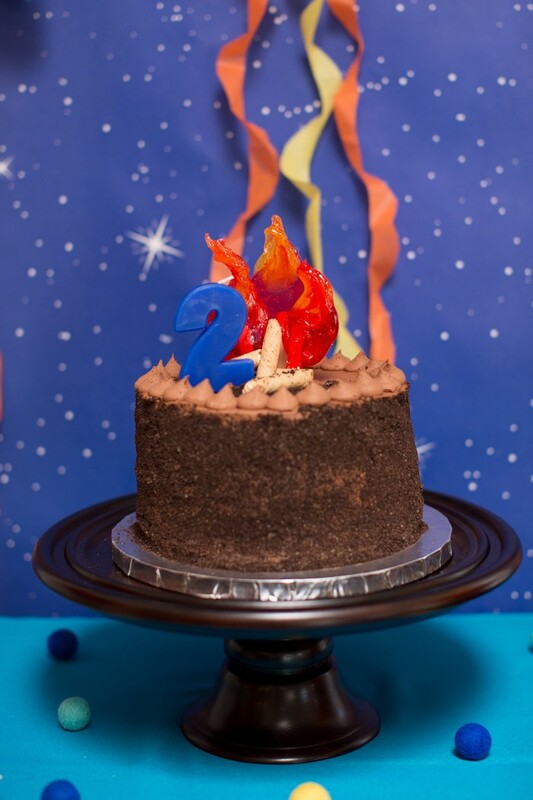 I created a campfire cake topper out of store-bought cookies and melted hard candy. 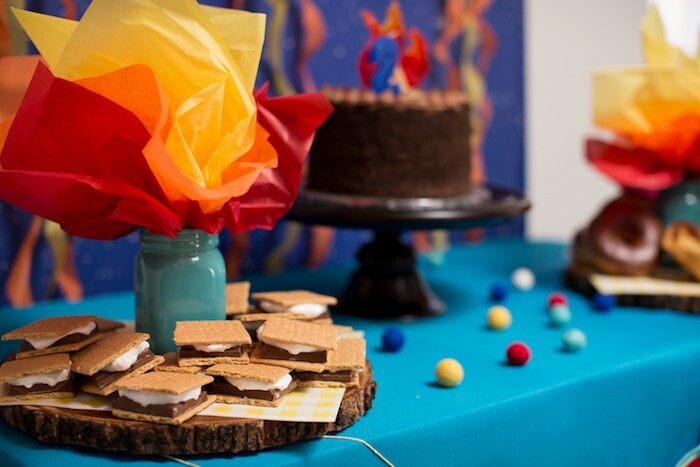 Where theres a campfire, there should be smores. 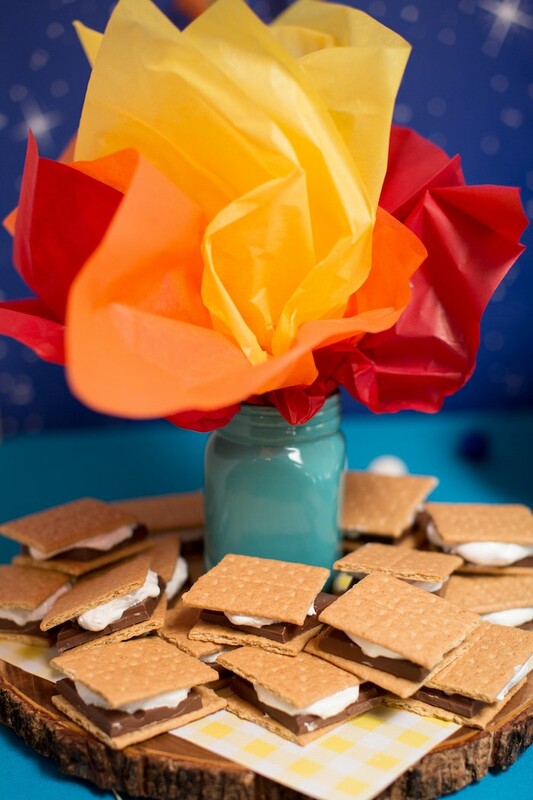 For ease of serving, I put together an unmelted version of this popular treat made with marshmallow fluff and the usual graham crackers and chocolate. If youve never made homemade marshmallow fluff I definitely recommend trying it out. Leftovers store well in the fridge and are amazing in hot cocoa. 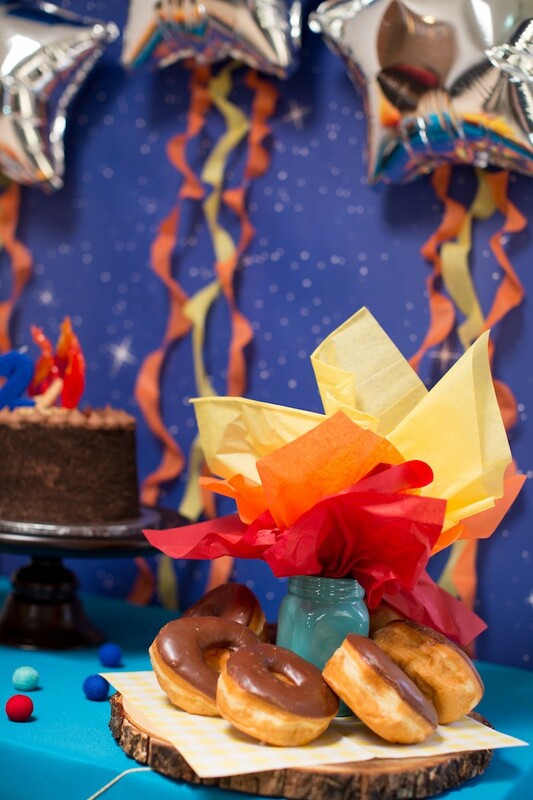 Chocolate and glazed donuts rounded out the dessert table and were the birthday boys favorite part. 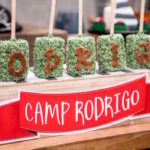 Other themed decor included bear straw cups for the kids, a giant 2 of photos from the year, a camper play tent, and more. 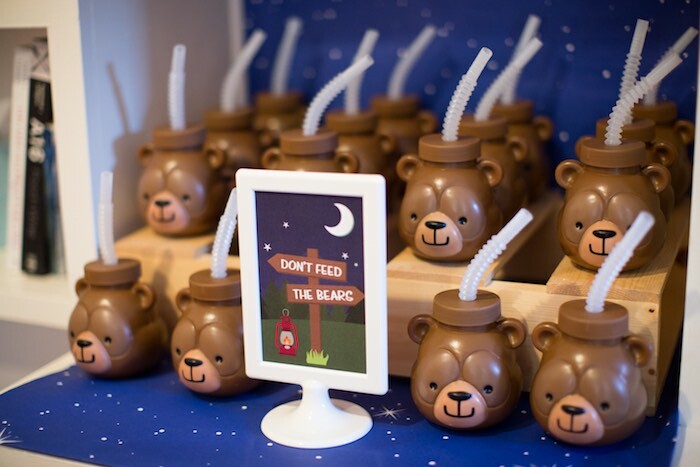 I setup a whole crew of the Bear cups with a sign that read, Dont Feed the Bears. Im not sure why I was surprised, but the kids all loved these cups so much. The photo 2 was more of a freeform project this time. 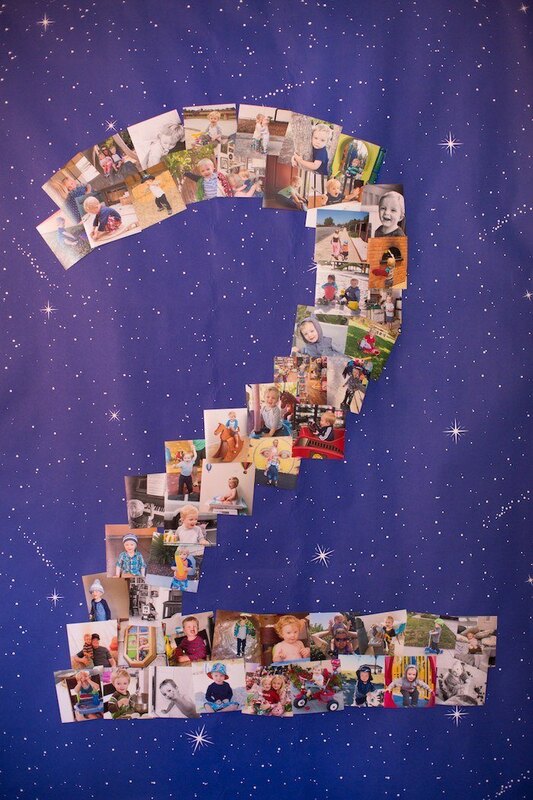 I just used double stick tape to attach Shutterfly square prints to night sky fadeless paper in the shape of a two. It took a little time to move the prints around until I was happy with it. If you need more structure, you can see the more planned-out version that I created for my firstborn here. 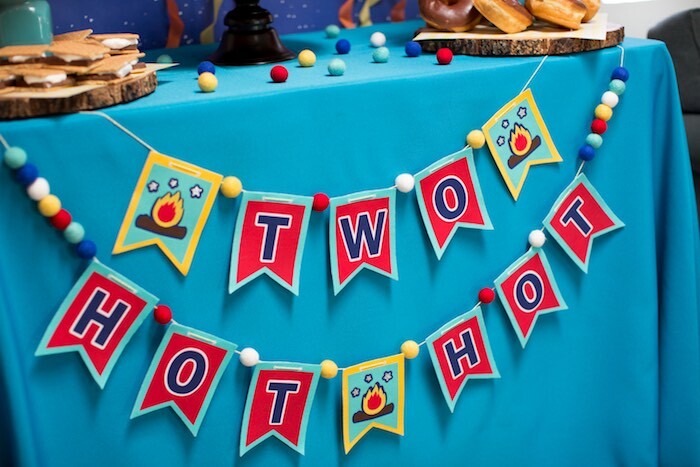 I used my Cricut to create various decor elements including a shirt for the guest of honor. 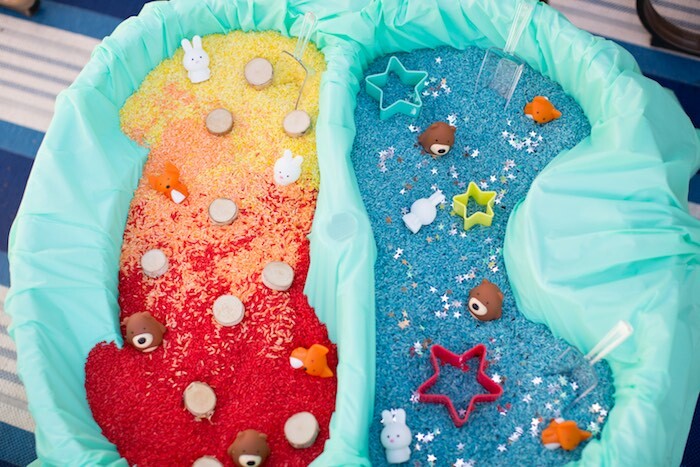 Sensory tables are so much fun for toddlers. If you do them quietly at home they dont even have to be a big mess. 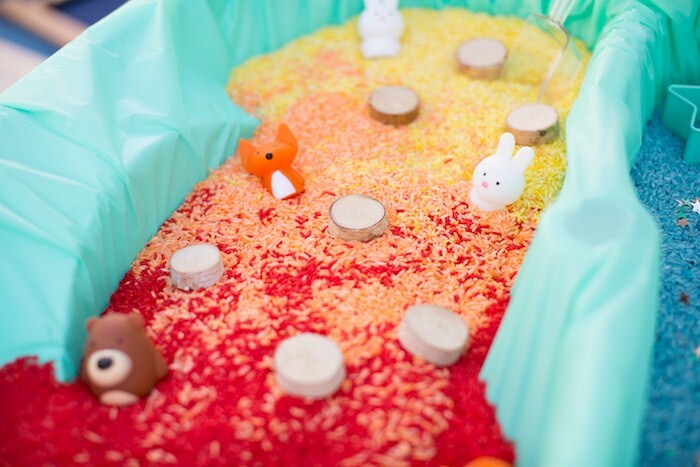 I put together a colored rice sensory table for play at the party. It was a giant mess in the end, but it was totally worth it. I used our water table and covered it with a plastic table cloth. I dyed rice for both sections- a campfire half and a starry night sky in the other half. 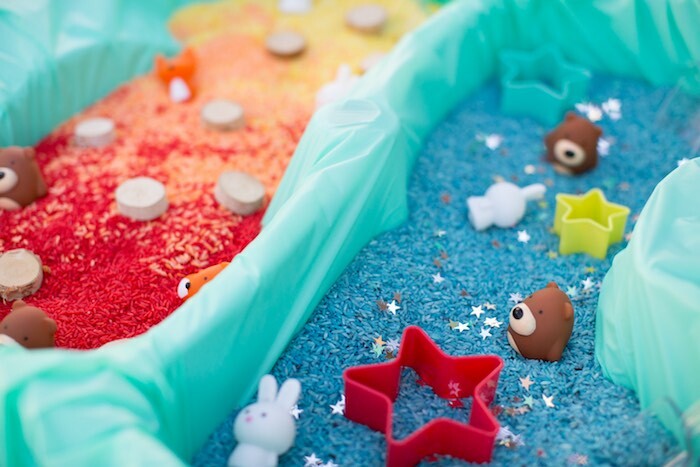 Along with the colorful rice there was rounds of natural wood, star shaped cookie cutters, scoops, woodland animal toys, and silver star confetti to play with. 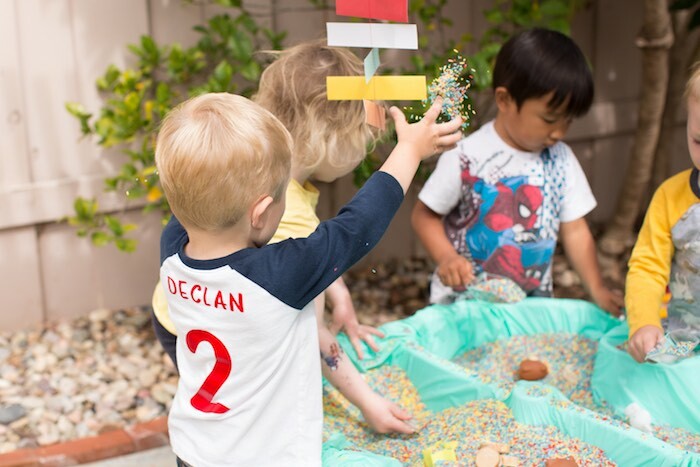 The kids loved it, and of course my kid was the one that started throwing the rice and sprinkling it on his friends heads towards the end. After all, its not a party till someone gets rice dumped on their head! Call me crazy, but I couldnt help but set out paint and glitter to let the party guests create their own campfire scene on canvas. I made two samples with my son ahead of time to show the kids that they could make a tent camping scene or a handprint campfire. I loved seeing how creative the older (6-7 year old) kids got. 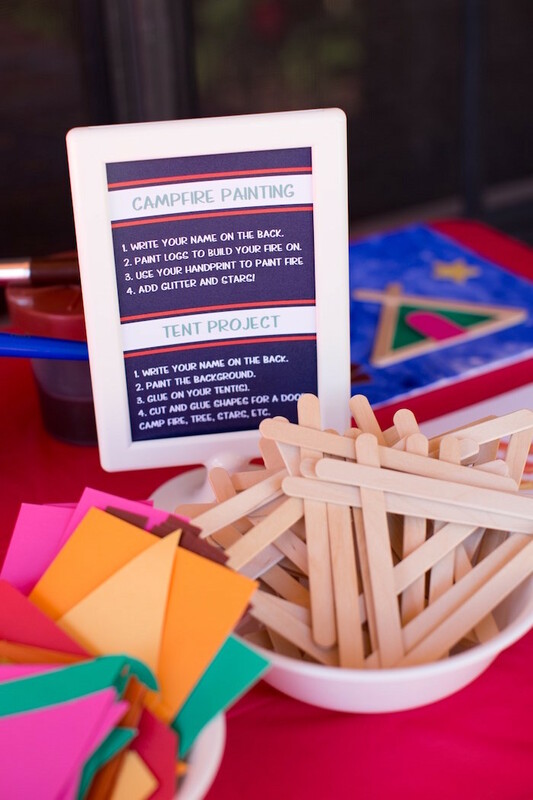 We even had a 3-dimensional tent among the bunch! 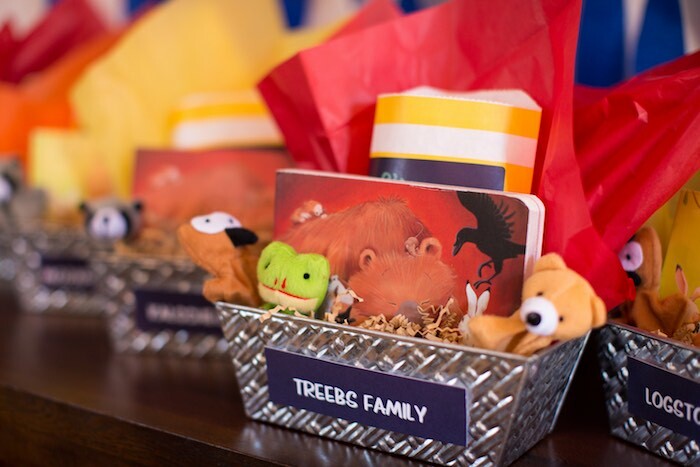 For favors, we sent each family home with smore fun in the form of a little basket of goodies including a copy of a board book from the Bear series by Karma Wilson. Bear Snores On was the first book we owned of the series and my son loved looking for the hot, hot campfire on each page. I also included a few woodland animal finger puppets to go along with the book. 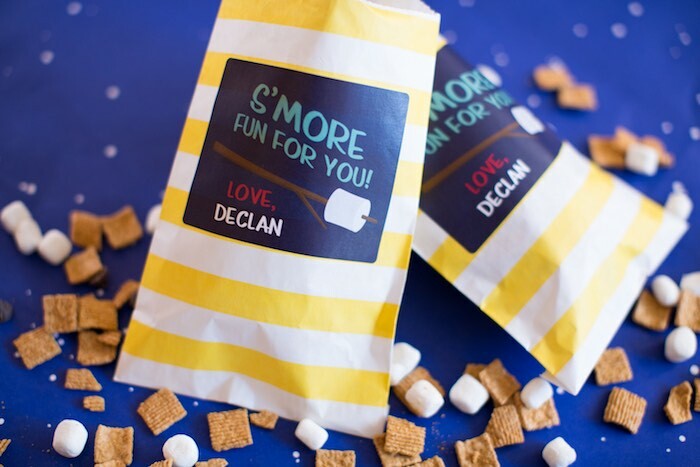 Lastly, I packed up some smores trail mix (a simple combination of Golden Grahams cereal, chocolate chips, and mini marshmallows) in a striped bag with a printable sticker. 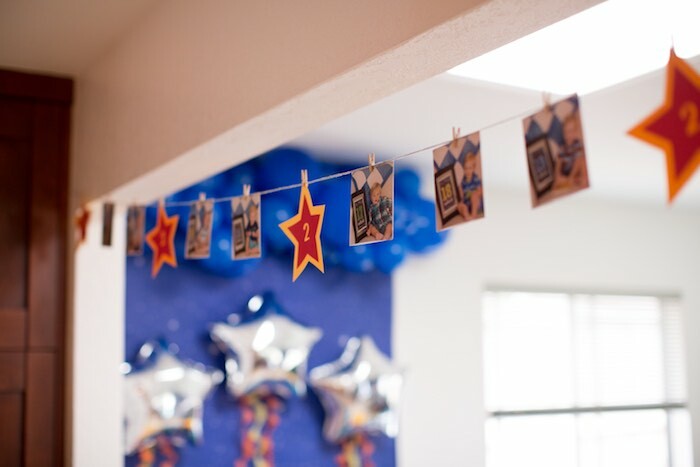 I know favors can seem over-the-top for a party like this, but it gives me joy to send everyone home with a little memory of the celebration.